I will review Lotus Lip therapy today which came as a savior for my super dry lips. I have the one in cherry earlier which got over last week so, this time I got Velvety Rose. I bought it from Lotus Herbals official website on Women’s day when they had a discount on their entire range. 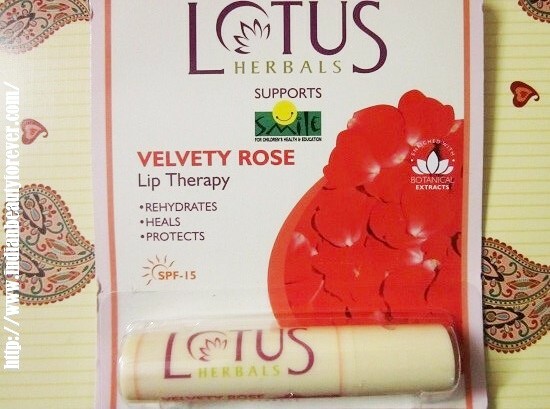 About the product: Lotus Lip Therapy's highly active moisturizing formula with high concentration of Shea and Kokum butter, helps to repair dry, cracked and chapped lips and protects them from the drying effect of cold, dry winds of winter, making them look healthier and smoother. Contents: Shea Butter, Kokum Butter and respective Fruit extracts - Mint extract, Vanilla extract, Cocoa extract, Cherry extract, Rose extract, Chocolate extract. My Experience: This Lotus Herbals lip balm comes in a retractable tube packaging which I really like as digging finger in the pot is something which I really don’t like. If you have noticed they have changed the packaging a little bit by making the cap longer. 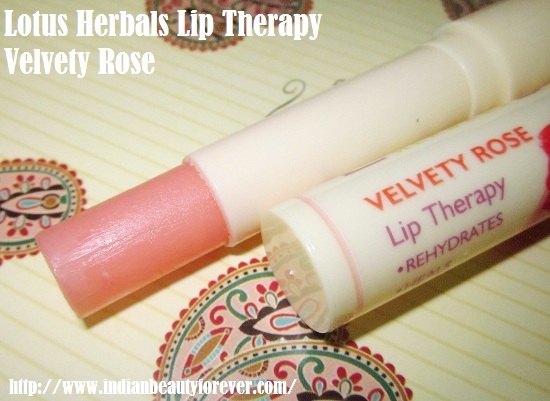 This variant Velvety Rose is a light pink color balm that is colorless but I must admit that it gives excellent moisturization. It is due to the ingredients like Shea butter and kokum butter which are well known moisturizers especially for dry skin. I have been using it all the time since the day I got it. It has proved to be a great balm for the night time and in morning you can wake up with soft and moisturized lips. I also noticed one thing that the quantity is less than the usual quantity provided I do not know whether it is with this variant or from now onwards they have reduced the quantity. However, the pack still displays 4 g of product. You may see that in the pictures below. This was the length of the tube when the pack was opened. It does not have any smell or taste unlike the cherry one which was a bit sweet in taste. Actually it protects from dryness better then the Lotus colored ones I guess. I like this variant so much that I will prefer this over the colored/ cherry, if I am thinking of buying the Lotus lip therapies again. I have dry lips so once I come out of the shower I immediately reach for my balms else my lips gets flaky. So, If you have the similar problem then do try to use the balms soon after shower or after washing your face. I did not do the swatches as it does not have any color at all. 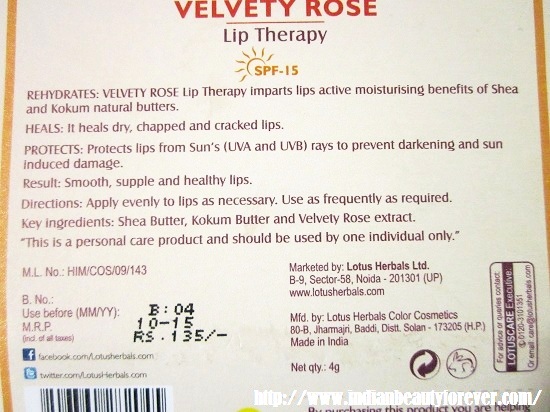 Lotus lip therapy balms are easily available online, drugstore and shops. Price is okay and affordable for the product quality. Retractable tube packaging makes is easy and convenient to use. This variant Velvety Rose is colorless and tasteless but very hydrating. 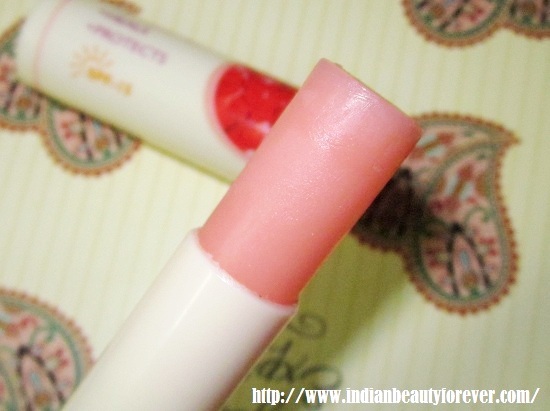 It has ingredients like Shea and Kokum butter that makes it a good moisturizer for your lips. My Take: Very hydrating and affordable lip balm that justifies its purpose perfectly. Do consider them if you are looking for a great lip balm at a decent price. I m more into clear lip balms. Will give this a shot. I have used cherry earlier.. I haven't tried it. It sounds very good! My lips are dry too. I think I will get this one for sure. Regarding the quantity, I completely agree there is something fishy going on. I repurchased my tinted sunblock and the pack is half an inch smaller in height than last year's pack and still it says quantity is the same. You will like this Gagan. :) I am using a lot these days and it is worth the money but then if quantity is reduced then they should atleast mention that properly.